Because at this point in my life I specialize in the recap and the mundane [see yesterday’s post]. And for your own personal knowledge, I always say “ReeeeCaaaappp” like rappers say “ReeeMiiiixxxx”. Cause I do have a love for rap music. Fo shizzle. Every writer’s conference is different and I think it is fair to say that every person will have a different experience. With that being said. Let me tell you why. In list form. Because Sunday nights and making lists have been friends since I was a child. 1. Jesus Speaks. First and foremost, Proverbs 31 Ministries loves them some Jesus and it runs through the conference like a river. No joke. They want the attendees to grow as professionals, but I would venture to say they care MORE that we leave there with a fresh heart. There was much less self-promoting than I have seen at previous places and much more cheerleading. Not the skirt type, the hug type. It was cool. And it had everything to do with Who was the focus. That being Jesus. 3. She Blogs. It’s about time someone gave Bloggers the big ups they deserve. It’s awesome to see Lysa (P31 bosswoman/author/on Oprah– watch it you will cry/enough said) recognizing that in all honesty, blogging is becoming a way to minister. And she has the foresight to see that their ministry needs to reach women through EVERY outlet- including blogs. Well played, Lysa. Well played. Here’s a handful of us, minus my buddy Missy. I’m not going to tag every, but sweet Jo-Lynne did- so check all these blogs out there. 4. She Sings. Good gravy alive. This girl can bring it- Lindsey Kane. She led our worship and I like her mucho. You need to hear her, buy it, book her at your church, all of it. 5. She Proposes Her Book To Real Agents. Yeah, that was a long one. 🙂 But the way they set up meeting with agents, publishers, etc. is awesome and VERY low stress. I was TOTALLY impressed. 6. She Eats Dinner in a Food Court and Discussing Methodism and The Bravo Network. Self-explanatory, but completely list worthy. Will I go again to this particular conference? Budget willing, absolutely. Did it go well for me as far as my writing goes? Yes. But that’s all I can say about it. Did I make new friends? Yes. 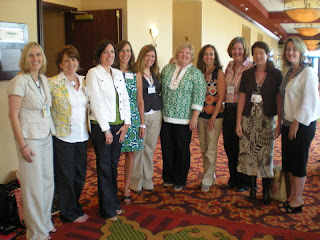 Was it fun to be around bloggers I already loved? Ab-so-freakin-lutely. If you are a new writer or a pro, or just a blogger who loves to blog, I TOTALLY think you should consider the SheSpeaks Conference next year- July 31-August 2, 2009. Because seriously- are you going to want to be outside that time of year? Obviously not. Inside a hotel loving Jesus and learning how to be a good writer? Don’t mind if I do. Mark it on your calendar… we can be roommates.